Kiss the Cow ice cream!" ​"Holy Cow the Dark Chocolate Daydream ice cream is soooooo good!!!" 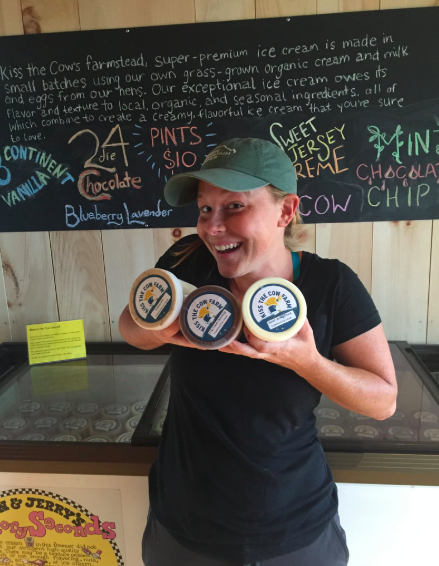 Kiss the Cow ice cream is a farmstead, super-premium ice cream made on the farm in small batches using our own grass-grown organic cream and milk and eggs from our hens. Our exceptional ice cream owes its outstanding flavor and texture from local, organic, and seasonal ingredients, all of which combine to create a creamy, flavorful ice cream that you're sure to love. Making a batch of ice cream takes two days. On Day 1, we run the raw milk from the bulk tank through the cream separator. Cream and skim milk go into separate, 5-gallon milk cans. These are transported to the creamery. Next we run the vat-pasteurizer, cooking the blend of organic milk, organic cream, organic sugar, organic skim milk powder and eggs at 175°. This takes about 5 hours. Then the mix is rapidly cooled before being moved to the walk-in fridge, where it continues to cool overnight down to about 40°. The cooling and aging period enhances the taste as the mixture is allowed to sit for about 24 hours. On Day 2 we churn the base, adding mix-ins as the semi-soft ice cream comes out of the churn. Each one-gallon batch takes about 10 minutes. The ice cream is then hand-packed in boxes for scooping or into pints, labeled and placed into the freezer to harden. This takes about 3 hours. Naturally, we conduct lots of quality control tests to ensure only the best ice cream possible! Next the ice cream is placed in our farmstore freezer to be sold to anyone who stops by. You can also find our ice cream at local farmers markets. ​"I swung through the milk house last Tuesday and bought two more ice creams! OH MY GOD, if I thought the dark chocolate was outstanding, it had NUTHIN' on the mint chocolate chunk!!! Randy, best damn mint chip ice cream I have EVER had, and trust me, I've made my way through some pints. I'm coming up with an ice chest next time!!" ​"My boys just about fell off of their seats the other night when we had some Sweet Jersey Cream! So did I! DELICIOUS!" ​​"The Dark Chocolate Daydream is AMAZING. ​Like, next-level.... the added texture of the brownie chunks, the little bits are a bit chewy, the bigger ones a bit crunchy.... you nailed it!"